It’s been a few weeks since my last post, which focused on the technical possibilities and implications of IMAX technology in Christopher Nolan’s The Dark Knight. Since then I’ve read a number of reviews and appraisals of the film at various film blogs and news sites (many of which make up my Links section), which tend to emphasize its direct and indirect allegorical and symbolic textures. Most recently, Ted Pigeon over at The Cinematic Art has written a sharp piece of criticism that highlights the social and political tone not of Nolan’s film but of these reviewers’ responses to the film. It would seem that in the weeks since I’ve seen the film, the dominant conversation has shifted away from Knight‘s technical and stylistic achievements to a more interpretive, if not totally reductive, schema that aims to set in relief the political overtones and undertones of Nolan’s film. As a piece of alternative programming, I’d like to redirect the focus a little bit and explore one of the most fascinating aspects of The Dark Knight: the sound design. There are a number of interesting sonic elements in the film — the propulsive bass, the blanketing textures of Hans Zimmer and James Newton Howard’s score, the crispness of artillery fire, and the supple sounds of Batman’s cape — but the vocal track stands out as a real accomplishment for reasons that you probably did not even consider. The construction of any vocal track begins with the production sound mix, captured by the boom operator and sound recordist on the set. For large and small films, production recordists must contend with environmental ambiences, crew noises, unwanted reverberation, mumbling and poor enunciation from actors, among other annoyances. The goal, as dialogue editor John Purcell notes, is “to make every single word as clear as possible. He or she has to remove any and all distractions, noises, or mumbles to make the words as clear as a bell.” If a production track cannot be salvaged for whatever reason, the job is left to a dialogue editor to piece together a usable track from an alternate take or through ADR (Automated Dialogue Replacement), a post-production process whereby the actor “loops” (i.e. re-records) her lines in a studio. The dialogue editor then assembles the track using the re-recorded dialogue. With the modern blockbuster, production recordists have their work cut out for them. 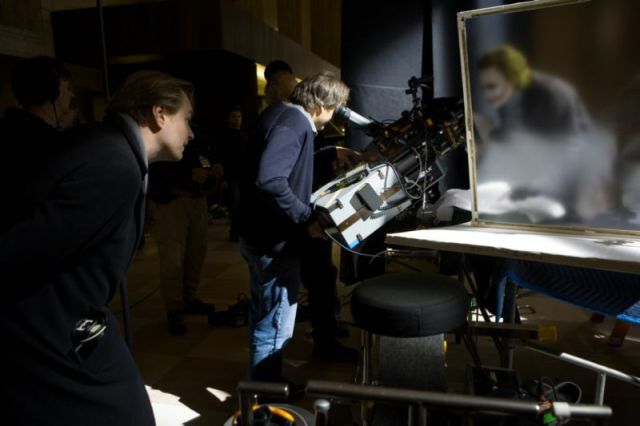 A film like The Dark Knight requires noisy air conditioners, smoke machines, movable rigs, characters speaking through masks and heavy makeup, unforgiving studio reverb, and don’t forget those ultra-noisy IMAX cameras. Which is why it is estimated that most Hollywood productions rely on post-production sound services to balance, sweeten, and clarify what could not be captured live on the set. I think I’ve become rather savvy when it comes to distinguishing between production sound and ADR. In fact, I became a little distracted by the piecemeal looping in Step Brothers, a film that seemed to rely on heavy improvisation, which explains the need for ADR to tighten the continuity. In some sense, the preference for production audio is tied to Nolan’s entire approach to the Batman series, which eschews excessive cinematic artificiality in favor of practical effects and solutions. Even with a healthy number of CG elements, many effects shots were captured the old fashioned way with a camera photographing actors in a real environment. In the same Wired interview Nolan stresses that practical shots, such as that of Batman being air-lifted out of Hong Kong by a KC-135, restore “the human element of choice: the little corrections, little imperfections. Certain uncertainties.” And, in my mind, this attention to practical solutions also restores a certain faith in the ability for filmmakers to accomplish complex maneuvers without an over-reliance on animation. (I will be sure to return to this topic in another post). With the death of Heath Ledger in January 2008, it was clear that the actor had not completed any post-sync “looping,” which could have jeopardized the final sound mix. However, supervising sound editor Richard King and production recordist Ed Novick have revealed that ADR sessions were not necessary for Ledger’s performance. In other words, Novick and his crew managed to capture the entire performance “live” on the set. Perhaps the penchant for live vocals and gritty recording has set in relief the instances where Nolan opted for sound with an artificial halo. Some people have commented to me that despite liking the film they found the voice of Batman to be distracting and altogether “unrealistic.” I haven’t been able to find any sources that account for the process by which Batman’s voice was modulated, but even to the untrained ear it sounds heavy and thick with a great deal of bottom-end added to Bale’s original track. Perhaps the bat suit comes equipped with its own voice modulator that ensures Bruce Wayne’s identity is never revealed. I admit that at times I found it hard to decipher what he was saying because of his lower pitched voice. The opening bank heist sequence is also notable for what appears to be post-sync dialogue. 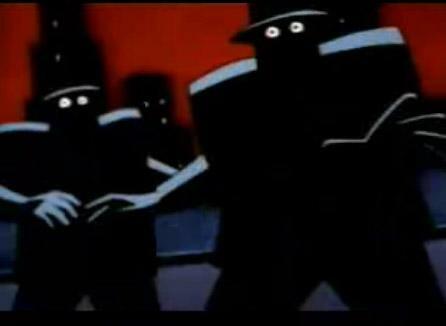 As the Joker’s masked goons execute the robbery we follow them from the roof to the bank vault. They converse with each other during the process, questioning the identity of the mastermind they call the Joker. My wife pointed out to me that these exchanges had the vocal feel of Batman: The Animated Series and feature-length film Mask of the Phantasm. The goon’s voices are exaggerated, even comic, impressions of thugs we associate with the gangster film. That these thugs are wearing clown masks gave Nolan an opportunity to stray from an avowed “realism” and embrace a broader stroke of comic book pastiche. Granted, it’s a small moment in a very long film, but the devil is in the details. The importance of voice in film can never be over-estimated. The voice provides immediate access to inner character psychology; a line reading can change the meaning of an entire scene; a vocal inflection can change the meaning of a word. Close-up recordings, like that of Willard’s narration in Apocalypse Now, envelop us in his tormented mind and bring us to the edge of comprehensibility. The absence of voice pushes us to strain our ears to hear what is not there, to listen through the screen and capture the elusive whispers of Lost. Additionally, there are those sound-theoretical issues that aim to draw a distinction between the voice captured “live” and that re-recorded at a later date. The seemingly unnatural separation between body and voice is a concern shared not only by Nolan but also by film sound theorists like Mary Ann Doane, Rick Altman, and Steve Wurtzler (see this anthology). ADR technology allows actors to re-perform, re-capture, and reform the performance, much like different “takes” of the same shot affords similar flexibility. It might be naive to assume that what we’re hearing is Heath Ledger’s “original” Joker vocals, untouched. Of course, it is probable that different vocal takes were utilized to match Nolan’s preferred image take, which completely removes any sense of an “original” performance. We must remember that modern film sound production is governed by the construction of a representational event. James Lastra has argued that, indeed, there is no original sound event! After levels are tweaked, takes are swapped, and voices are electronically modulated and edited, we are left with a constructed sound event that owes very little to the pro-filmic event (i.e., the thing that is being filmed or the location being filmed). In the Film Sound Daily interview with Richard King, King admits that the Bat Pod sound, which can be described as an always-ascending tone (see the Shepherd Tone), replaced the actual sound of the Pod, which was that of a small Kawasaki engine. Thus, the Bat Pod exists only in the film and within its spatial confines that are outlined by the cinematographer, set designers, and sound designers. In this sense, there is only the representational nature of the cinematic space (the diegesis, to use a film nerd term). Yet, despite this film theoretical rhetoric that attempts to shatter the illusion of live performance, there is something so immediate and unfiltered about hearing (and seeing) Ledger’s performance as a unified whole. Even if things were sweetened, even if different takes were ultimately used, the real sense of “liveness” still resonates with me.